ANYWAY. There was a parade and celebration today that was a HUGE. DEAL. (Remember how we live in Houston? Yeah.) My kids entire school watched the celebration in the cafeteria. (Best. School. EVER!) The governor of Texas even declared it Houston Astros Day. 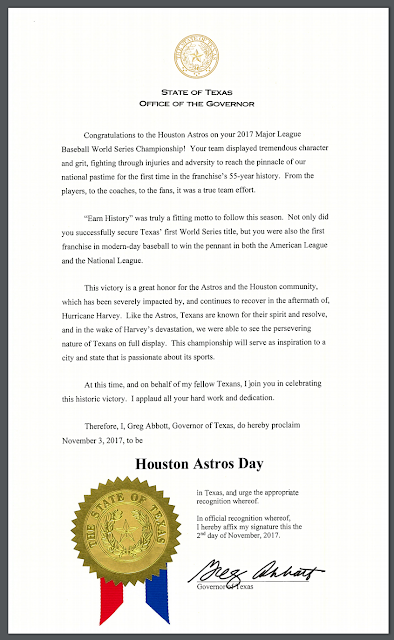 I tried to find a picture of his "excusal letter" he showed during the celebration, but to no avail. It was pretty funny though. He presents these official declarations and then says for everyone else he has this letter: Please excuse (fill in the blank) today from school work errands.... etc. etc. It was pretty awesome. Awesome to live in a community that pulls together in the face of disaster. Awesome that we have so much to celebrate after (and still amid) such devastation. Life is full of ups and downs. Long story short, I'll have that video for you on Monday. Thanks for checking in. Now go celebrate!